On June 10, Bracket Labs celebrated a huge milestone for the company—its fifth anniversary. We are grateful to all of our customers, partners, and friends for an outstanding first 5 years. As the new(ish) Director of Marketing, I’ll let you in on a little secret. Bracket Labs is an awesome place to work, and not just because we have great snacks on hand at all times. It is a great place to work because of the people. The culture is hands down the best one I’ve ever experienced. We are committed to excellence, committed to our customers, and committed to helping each other grow as professionals. I’ve been working long enough to know creating a successful company with a stellar team and culture doesn’t happen by accident. 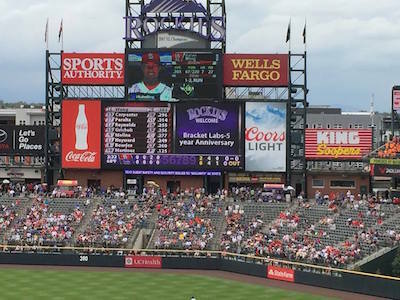 So while we were celebrating the anniversary at Coors Field, new members of the team were lucky enough to hear the “origin story” of Bracket Labs firsthand. It’s a great story worth preserving and sharing. A little over 5 years ago Eric was working as a consultant at the company where Blakely was working. They realized they had many similar values and experiences in the working world. (Not all of them as positive as they would have hoped.) They talked a bit about starting a company together that would be a place where they themselves wanted to work. The talk was pretty high-level at first since Blakely had small children and Eric was expecting his first child at the time. But things progressed quickly and about three months later they were signing the papers to formalize the business to be known as Bracket Labs. Hard at work at Bracket Labs first office in Blakely's basement aka "The War Room". The newly formalized company moved quickly to develop its first product—Campaign Calendar—an app that allows marketers to schedule and manage campaigns more easily in Salesforce. They were working with a contract developer at the time using Blakely’s basement as office headquarters. Within the first few months customers started signing up (and paying) for the app. As all entrepreneurs will tell you the first few years are exciting, challenging, fun, terrible, hard, and everything in-between; And like all entrepreneurs Blakely and Eric have many funny, scary, and inspirational stories to share (the next time you see them you should ask). But to keep this to a Reader’s Digest version, we’ll move ahead to a couple of years later. The bootstrapped company is growing and a new product has been added—TaskRay—a modern project management app for Salesforce. Right away they realize they have a hit. It starts taking off and quickly becomes the lead product for Bracket Labs. Blakely and Eric have worked with a few different contract developers when they hit a development snag. No one can seem to figure out how to solve this particular problem. Enter the missing piece to the Bracket Labs co-founders’ team, Mike Tetlow. Mike is a fastidious developer who believes in doing things right. He solves the problem, joins the team, and begins working to solidify the foundational elements of TaskRay. He and Blakely continue to push the product to greater levels of performance and usability while Eric continues selling. All three of them are also doing several other jobs including customer support, marketing, and taking out the trash when necessary. That brings us to almost present day. As the company continues to grow Blakely, Eric, and Mike realize they need more help to get to all the different parts of the business that need attention. In the first half of 2014, they have so much business they decide to add a new team member to help. Enter Darren Geary customer support and sales manager at Bracket Labs. It also marks the first time Bracket Labs has office space outside of Blakely’s home. The team sets up shop in beautiful downtown Louisville, CO (right outside of Boulder). And this team is fired up! We’ll be headed to Dreamforce for the 5th year in a row, but this time in a booth (come find us). We are ready to take this company to the 10th anniversary and beyond all while maintaining the wonderful culture, outstanding product offering, and unwavering customer support that Bracket Labs has cultivated over the past five years. Thanks again to all who made these first five years possible.